The University of Rostock wanted to carry out a deliberate release with genetically modified streptinomycin-/spectinomycin-resistant petunia (event T16). The genetic modification of these plants was performed in the plastid genome and not in the nucleus. Plastids are inherited maternally and not via pollen, making vertical gene transfer with other sexually compatible plants virtually impossible. The aim of the release was to assess whether gene transfer of plastid DNA via pollen is possible in petunia in the field. The frequency of gene transfer of plastid DNA via pollen in petunia is completely unknown, but in tobacco it was measured in the greenhouse with a probability of 0.01% (Svab and Maliga, 2007). In order to determine whether this frequency holds true for other plants and in the field it was necessary to apply for a multi-annual release. In the frame of this experiment, genetically modified petunia plants (event T 16) are cultivated as donors around plants of the putative recipient, non-transgenic petunia line (W 115). The seedlings of the non-transgenic petunia are analysed for any streptinomycin/spectinomycin resistance and for their expression of β-glucuronidase. Greenhouse and lab assays. Field trial stage. In Germany field trials with genetically modified plants have to be approved by the Federal Office of Consumer Protection and Food Safety (BVL), which has to decide within 90 days after the receipt of the application. However, several conjunctures resulted in severe delays. One of the main problems is that the presentation of the proposal to the public leads only to a 30 day extension of the deadline, while this actually takes 65 days. Secondly, several other institutions like the Federal Agency for Nature Conservation (BfN), the Robert-Koch-Institute (RKI) and the Federal Institute for Risk Assessment (BfR) have to be involved in the decision process, which normally needs 20 days. In addition, the process can only continue after the Central Commission for Biological Safety (ZKBS) has given its opinion. Since one of their meetings had to be cancelled, the petunia approval suffered an additional delay of 21 days. As a final add-on, the BVL has to present their approvals to the Federal Ministry of Food, Agriculture and Consumer Protection (BMELV) which again can take a lot of time. The delay of 86 days for the petunia dossier is especially remarkable since there were no appeals against this trial at all. 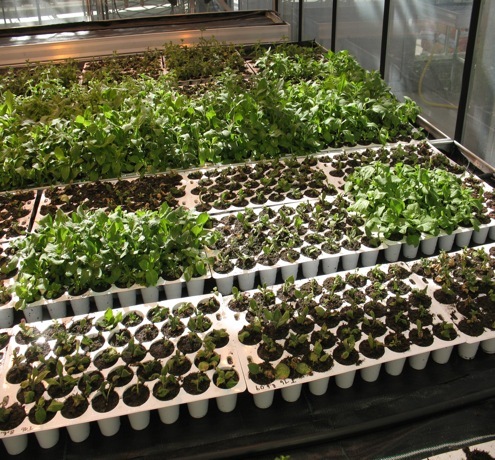 Since the plants had to stay over the hot summer period in the greenhouse, they had to be transferred to chilled chambers, leading to additional costs of more the € 5.000 in rent. In addition, flowers had to be removed and plants that reached a critical height had to be propagated again via cuttings. In order to do so, the technicians had to drive 30 km every second day to reach the chilled greenhouse. Since this is a governmentally funded project we now have to apply for additional funds to be able to fulfil all the topics described in the project. The project is funded by the German Federal Ministry of Education and Research (BMBF) with € 297,359. Other projects also funded by the ministry depend on the material produced by the field experiment. Svab Z, Maliga P (2007). Exceptional transmission of plastids and mitochondria from the transplastomic pollen parent and its impact on transgene containment. Proceedings of the National Academy of Sciences of the United States of America 104:7003-7008.